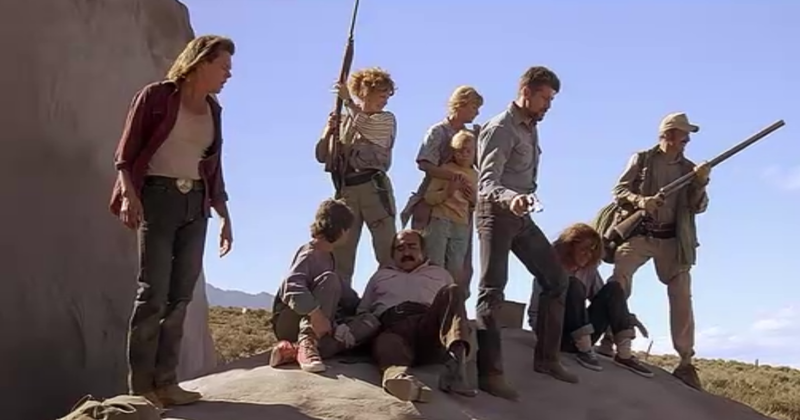 Tremors is actually two movies in one. On its own terms, it’s an enjoyable modern sci-fi horror-thriller, with good pacing and a sense of humor; but it’s also a loving tribute to such 1950s low-budget desert-based sci-fi-horror films like Them!, It Came From Outer Space, Tarantula, and The Monolith Monsters. Kevin Bacon and Fred Ward are the stars, a pair of small-town handymen living in a small desert community, who stumble upon several difficult-to-explain phenomena, including a couple of people who’ve died under extremely strange (and, in one instance, very grisly) circumstances. Eventually, they and a handful of their neighbors find the cause: gigantic prehistoric worm-like creatures that streak under the desert the way fish swim through oceans, reaching up and grabbing anything they need for food. Cut off from the outside world, they have to figure out how to get across the desert alive while these creatures — that are smart as well as fast — close in on them, stalking them like monster sharks. The film benefits from the presence of special effects that are good enough to pull this all off, keeping the shock value high, and also from a subtly humorous script and performances to match by the entire cast, and director Ron Underwood’s breezy pacing of the whole picture. Now onto the story, I liked the basic layout of the story because it’s real simple, Small town in the middle of nowhere people trapped and they can’t even trust the ground they stand on. This basic story sets up isolation from help and requires the town’s people to work together as a community to save the town from the Graboids. If you can’t trust the ground beneath your feet where is safe? Something I didn’t expect from this was a love story that was not only pretty good but also worked with the main story and didn’t get shoved in our face. The music in this film is very good as well as it can go from fun wild west to horror scene, it at times did sound like Jurassic Park this happened normally when setting the tone for example the time they found the dead construction workers and the music was shocking/thrilling. So let’s talk about something more fun like the visuals. The Visual Effects in this film were really good and because it was a low budget film and there weren’t many CGI soaked smaller films the Graboids had to be made and controlled via puppetry which looked pretty good and was choreographed really well. My favourite scene using these visuals would have to be when the Graboid breaks into Burt’s reckroom and they shoot at it with all the guns on the wall. I love that scene where they find the car buried in the ground and they freak out; it’s the question of what could have buried a whole car in the ground. Not who designed the Graboids but they are a fascinating creation and will be posting a funny video at the end of the review. The camera angles in this film are really good as well, specifically the point of view from the Graboids as they hunt, it doesn’t really make sense because they are subterranean but I still like seeing through the hunters eyes. 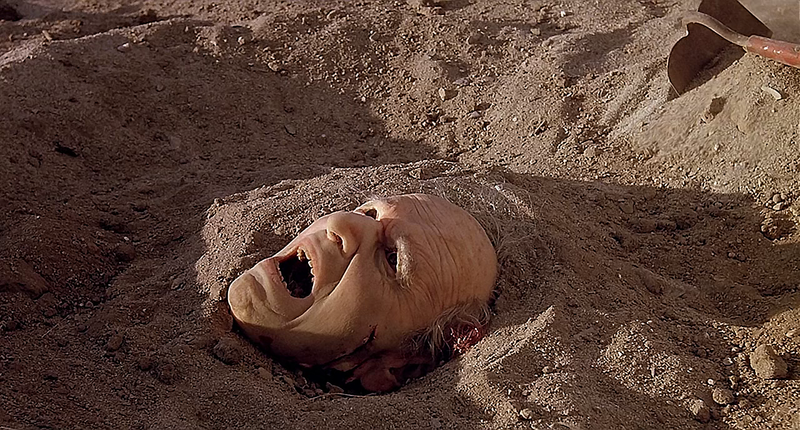 You know what I found funny watching this film, whenever they said about the Graboids smell I actually imagine what that smell is like even though they never specifically describe it, I only noticed I made up this idea of a smell after a couple of views of the film. I think this proves the impact the film can have when viewing (or I am just weird). 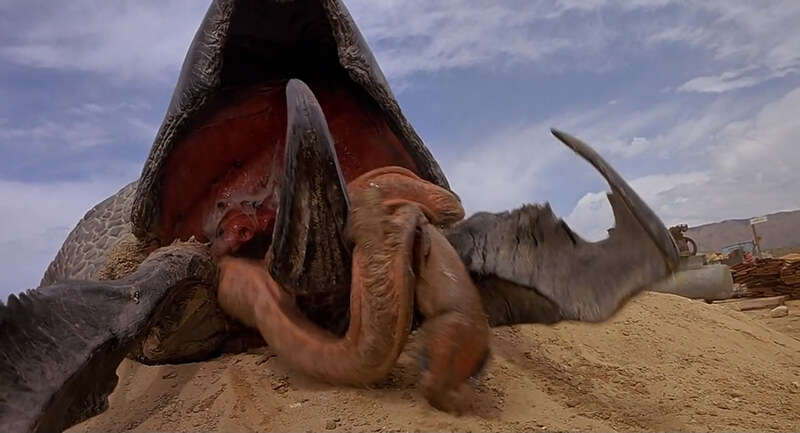 The best reviews I have found would be these “I think there should be a lot more movies like Tremors out there, and no I don’t mean more sequels.” Scott Weinberg. 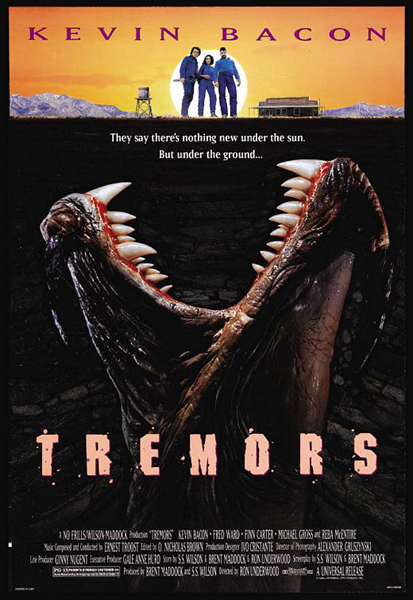 I’d love to see more films like this, I saw Grabbers recently and found that to be something similar, but I don’t need to see a fifth tremors film (I would still watch it though). Also “A flawless B-movie about giant, underground worm creatures” Jon Niccum. It’s a hard story to sell but I couldn’t wait to throw my money at them, so well done to them. Lastly “The pinnacle of recent B-monster movies. It’s what Eight Legged Freaks wants to grow up to be.“ Widgett Walls. I did enjoy Eight Legged Freaks but it was a little more on the comedy side than Tremors and suffers a little from the lack of fear. My favourite scene would have to be when they go to remove the hat from the ground because I was so expecting that there would be a head under it that I started to think it was too obvious and that it wouldn’t be there. So when they did have the head there it actually shocked me a bit. Epic post. We have the same taste. Thanks for visiting my site!